The position is full-time contractual with the possibility of renewal. 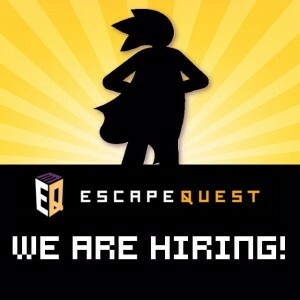 Please send your resume and cover letter to info@escape-quest.ca, ATTN: Kevin Noseworthy, Managing Operating Partner. Subject heading on the email should read Full Time Quest Guide Application. Application deadline is noon, Wednesday, May 18th, 2016. Only applicants selected for an interview will be contacted. The position is part-time contractual with the possibility of renewal. Please send your resume and cover letter to info@escape-quest.ca, ATTN Kevin Noseworthy, Managing Operating Partner. Subject heading on the email should read Part Time Quest Guide Application. Application deadline is noon, Wednesday, May 18th, 2016. Only applicants selected for an interview will be contacted.